LEGAZPI CITY (Jan 24) - The Criminal Investigation and Detection Group Provincial Field Unit has filed a complaint for illegal possession of firearms and explosive against Daraga, Albay Mayor Carlwyn Baldo at the Albay Provincial Prosecutors Office on Wednesday. Police Chief Inspector Ronnie M. Fabia in his complaint disclosed that Baldo violated Republic Act 10591(The Comprehensive Firearms & Ammunitions Act) and Republic Act 9516 (Illegal Possession of Explosive). 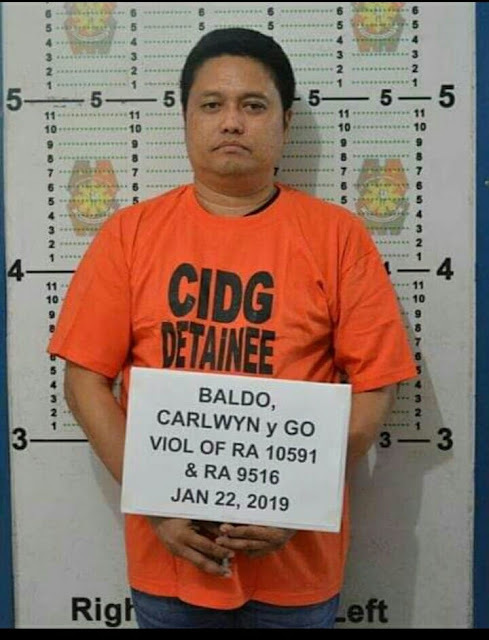 The case was filed against Baldo after a search at his residence and found unlicensed/ unregistered firearms and ammunition to wit: two (2) pieces of cal. 45 pistosl without magazine inserted: one (1) with trademark COLT MK-IV SERIES 90 with Serial Number 924173 and one (1) with trademark COLT GOVERNMENT MODEL with Serial Number 517381 chamber loaded with ammunition for cal.45; one (1) complete round of 40mm which is being used in M203 grenade launcher, a high explosive ordnance capable of destructing properties and inflicting injuries or death to personned when detonated, listed in the receipt inventory of properties seized. Baldo was arrested but had to be taken to the UST Hospital-Legazpi with Admitting Diagnosis of Bronchial Asthma in Acute Exacerbations; Upper Respiratory Tract Infections; Diabetes Mellitus, Type 2 based on the certificate of confinement issued by the Attending Physician/Medical Director Edberto R. General MD. FPCP, PPSEDM, FACE of the said hospital.